There is something to be said about a nation that goes through turmoil — like that of a 25-year civil war or the devastating tsunami of 2004 — and is still as genuinely warm and welcoming as Sri Lanka is. Thankfully for travellers, the colourful island just off the southern tip of India has since recovered and become a burgeoning destination once more. A recent trip took us south west, about two hours away from Colombo by car, to the historic capital of Galle. Steeped in history and brimming with old-world charm, we explored this beautifully-preserved coastal city to bookmark the top places to see, eat, drink, do and stay. 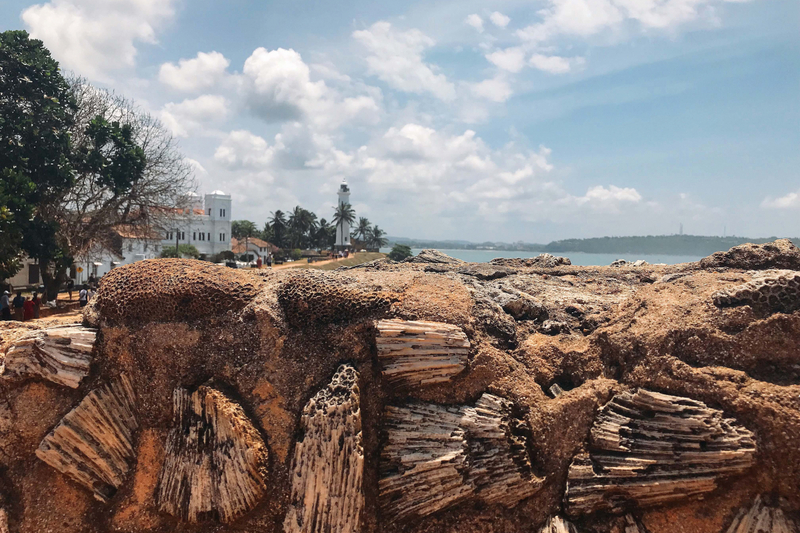 The history of Galle Fort extends over 400 years; possessing a rich past with the Portuguese who built it, the Dutch who fortified it (into a walled town measuring 36-hectares), and the British who took over and modified it. Today, the fort is a UNESCO World Heritage Site and maintains much of its appearance, thanks to its sturdy granite and coral construction. The old town, local schools and working courtroom also remain and the blend of cultures that reflect Sri Lanka’s modern day multiculturalism can be seen across the town scape — think Buddhist temple next to a Dutch church and an Anglican cathedral near an Islamic Mosque. It’s worth spending a full day here leisurely walking and exploring, as well as the streets that are now filled with stylish boutiques, unique cafés, galleries and restored hotels. After all that walking, you’ll want to take a moment to enjoy one of Sri Lanka’s primary exports and there’s no better way to do that than with afternoon tea. Stay within the ramparts of Galle Fort and you’ll find luxury hotel Amangalla, part of the international group of Aman Resorts, which occupies a stunningly restored 17th-century Dutch colonial building. Sit on the elegant library veranda overlooking the gardens and enjoy afternoon tea made with the finest Ceylon varieties. Opt for the rooibos yala or Handunugoda white and enjoy with a selection of finger sandwiches, cakes, tarts and champagne. One of the highlights in Sri Lanka, a country formerly known as Ceylon, is to learn all about their 150-year-old tea industry through a guided tour at a tea plantation. We visited Handunugoda — the only tea estate in close proximity to the sea, which is said to give the tea its distinctive flavour and sampled their luxury Herman Teas. Our favourites included Sapphire Oolong, which is not available anywhere else in the world, and the most sought-after Virgin White Tea. Originally from China, the tea holds its own legend where emperors asked for a tea free of any contamination and called for virgins to wear silk gloves to harvest with gold scissors into gold bowls. Fast forward to today and there are no gold scissors, among other things, but gloves are still used to prevent tainting. Tea pickers cut the tea buds at dawn when the buds unfurl to get the very best yield, albeit small, which also pick up a pretty price at US$153 for 100g. Herman Teas, Handunugoda Tea Factory, Tittagalla, Ahangama, Sri Lanka. When you’re not sipping on one of Sri Lanka’s more famous drinks, you may want something a little stronger. Luckily, a chic and contemporary beachfront hotel perched on Habaraduwa Beach holds the answer, and it’s at the KK Beach Bar. Designed by British interior designer, George Cooper, the hotel offers a cool and contemporary retreat that overlooks a pristine stretch of sand dotted with palm trees. Spend a balmy evening watching the sun go down, and order one the refreshing KK signature cocktail, made with dark rum, fresh lychee, lime and passion fruit juice. Offering a luxury escape in the quaint fishing village of Talpe is Tanamera Estate. This private beach residence, set amidst lush gardens, coconut palms and sweeping views of the Indian Ocean, successfully blends the intimacy of a private villa and the hospitality of a five-star hotel. Sleeping a total of six guests in three bedrooms, the property is designed with classic Sri Lankan architecture in mind, accented with colonial character and vintage interiors. High ceilings, spacious ensuite rooms with archways, soaring pillars and verandas make up the estate, and as if that wasn’t enough luxury, the dedicated concierge and team look after your every need which include some of the best authentic Sri Lankan meals on demand. Sri Lanka was described to us as “India Lite” and this is apparent in its cuisine too. The food is lighter with liberal use of local fruit, seafood and spices instead of meat. Some must-tries include pol sambol, a spicy coconut relish made with freshly grated coconut, chilli pepper and red onion; biththara appa, or egg hopper which is a crispy crêpe-like bowl made of fermented rice flour and coconut milk that is filled with a whole egg and served with a multitude of ingredients; and parippu, a deliciously comforting yellow dhal curry made with lentils cooked in coconut milk.